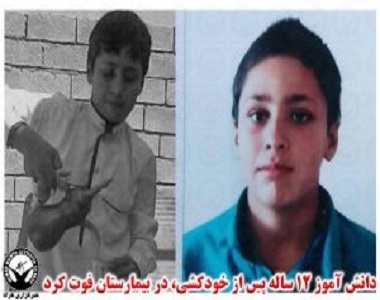 HRANA News Agency – Abbas Badavi, 12-year-old student living in the city of Shoosh, died in the hospital after committing suicide. His relatives, believe his expulsion from the school, is the reason of this kid’s suicide. According to the report of Human Rights Activists News Agency in Iran (HRANA), Abbas Badvi, a student from Shoosh, after had committed suicide “punishment and expulsion from school”. Abbas Badvi, 12, from the village of Khois, of Shoosh, and the student of Hadaf School, attempted suicide at 8 pm on Friday, December 30, 2016. A source, close to the family of the student, told HRANA’s reporter: “Abbas had gone to school as usual on Wednesday and because of the delay and as the school entrance door was closed, he entered into the school over the wall and then he was punished by the PE teacher and was expelled from the school. Abbas discuss the matter with his mother, but his mother was afraid of being subject to other dimensions and feared of conflict and complaint, so she prevented the news to be heard by her husband”. The source continued: “Because of the pressures and mayhem by his teacher, he attempted suicide at home two days later on Friday at 8 pm. His Family in the first few minutes realized that their son had hanged himself and transferred him alive to the hospital, but he died the next day at 5 am in the hospital. The family explained the causes of this suicide and what had happened in the hospital, and the hospital’s stuff informed the police force and the teacher was summoned to the police station. However there is no exact information about the Department of Education’s action in this regard”.